A ridge vent is a continuous vent along the peak of the sloped roof of your home, installed with a low profile. This provides an effective and consistent cooling without the need of any power source as it allows the escape of damp or warm air from your attic. It also adds to the energy efficiency of your home as it regulates the air that comes in and out of your attic which can affect the temperature of the living space below. Why do I need a ridge vent? A weather-tight roof may trap hot and cold air, which is why proper ventilation is needed. A ridge vent may just be the perfect solution to prevent hot or cold air from being trapped inside your home. This can avoid problems such as the damages that can occur to your roof joists, floor boards and most importantly the possessions stored in the attic due to the extreme temperatures, or the frost that might form on the underside of your roof which may eventually cause condensation and dripping inside your home. How does a ridge vent work? With soffit vents installed on your roof gutter, air is able to enter inside your attic. This air rises and exits your home through the ridge vents at the peak of your roof. Since air is continuously exchanged and ventilated, it prevents hot air from being trapped inside your attic during summer, and it also draws out moisture during winter. For these functions, a ridge vent is an essential and helpful installment in your home which works all year round. They are also designed to blend with your roof so that it would not affect the aesthetics of your home. Is a ridge vent enough for my attic? 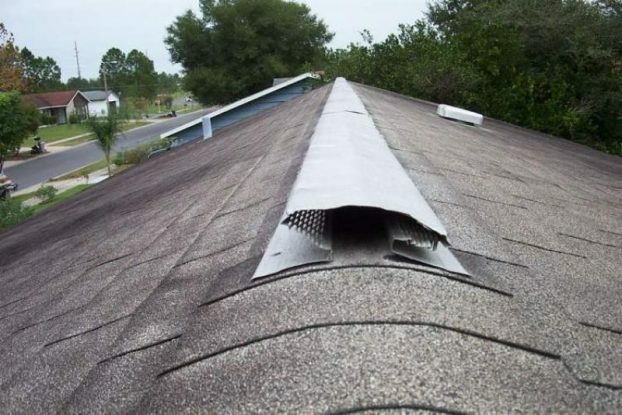 Ridge vents are some of the most efficient and cost friendly roof vents, according to most roofing experts. Sometimes, ridge vents are placed with weather stripping or external baffles, which are blinders that prevent air from outside to cross over the vent, thus preventing rain, snow or other unwanted materials from entering your attic. Proper insulation and ventilation is a must in your roof. A ridge vent can do the job as it provides a lot of benefits for your home. However, it is very important that they are installed properly, or else they would just end up useless or even cause damages to your home. Contact your trusted roofing company today and get to know more about how a ridge vent is perfect for your attic.